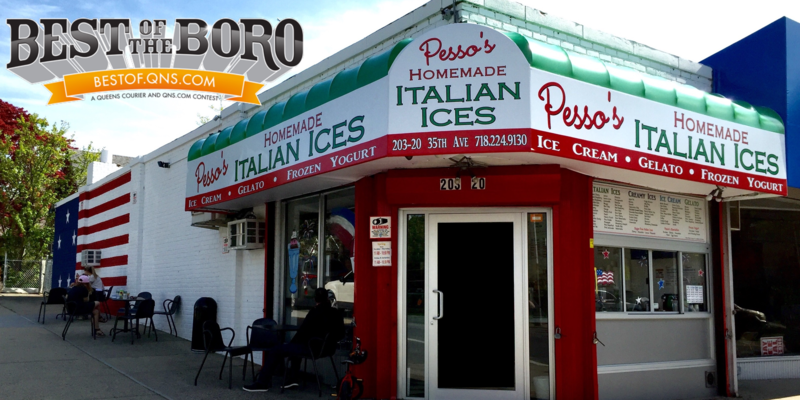 Location Pesso's Ices, 203-20 35th Ave, Bayside, NY, 11361 Phone 718-224-9130 E-mail pessosices@gmail.com Hours Open Everyday: 1-10 PM —— We are Open on Easter! March 28, 2019 March 28, 2019 Pesso's IcesLeave a Comment on Guava Ice is back! Enjoy a sunny day with this creamy tropical fruit Italian Ice! Guava Ice is back! Enjoy a sunny day with this creamy tropical fruit Italian Ice! Enjoy a sunny day with this creamy tropical fruit Italian Ice! Previous We’re the Best in Queens, again! Thanks for voting us the Best Ice Cream in Queens for the 3rd Year in a row, and the Best Dessert in Queens for 2019! Next Did you know Mr. Pesso & his Son make every single flavor in small batches right in the back of our store? Have you tried our Homemade Mint Chip Ice Cream? Pesso Jr hand mixes in the delicious Chocolate Chips! Happy Passover! We are open all weekend for Passover & Easter! Enjoy the classic holiday treat of Jelly Ring in a delicious Homemade Italian Ice! Toppings make any flavor better! Check out our wall of Toppings and add some to your favorite flavors! Mr. Pesso & his Son are always making fresh batches of all of your favorite flavors, and some new ones! We make everything ourselves right in the back of our store!